In July, 1969, Neil Armstrong stepped down upon the lunar surface and proclaimed, “One small step for a man, one giant leap for mankind.” This voyage for our country was indeed a giant leap for the United States and patriots around the country were proud. For hotel sales people, “leaping” is a daily event. Successful sales associates practice their craft daily and are not afraid of taking chances. They are professional, clever, and entrepreneurial. Every fourth year is a leap year (as a rule of thumb) according to the Gregorian calendar. February 29, 2016 will help clean up our solar system’s “messiness” (one earth year does not take an exact number of whole days. In fact, it takes 365.2422 days, give or take). So being the sales and marketing person I am, I want to capitalize on this event and “stand out from the crowd” by giving my customers a reason to celebrate…. and giving you another reason to visit your customers. Tradition. According to an old Irish legend, St. Brigid struck a deal with St. Patrick to allow women to propose to men (and not just the other way around) every four years. This is believed to have been introduced to balance the traditional roles of men and women in a similar way to how Leap Day balances the calendar. 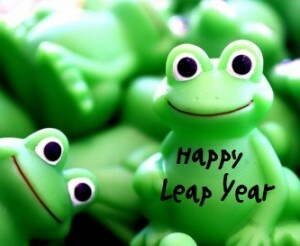 In Ireland, a woman proposing to a man on Leap Day is considered good luck (remember the 2010 film “Leap Year”). Fact and Tradition. In Scotland, it used to be considered unlucky for someone to be born on leap day, just as Friday the 13th is considered an unlucky day by many. To counteract this perceived curse, (unmarried) Queen Margaret allegedly enacted a law in 1288 allowing women to propose on Leap Day but the proposer had to wear a red petticoat to warn her intended that she planned to pop the question. Fact. Greeks consider it unlucky for couples to marry during a leap year, and especially on Leap Day as it considered inauspicious and the relationship is thought likely to end in divorce. Kiss a frog – marry a prince! Happy Leap Day! So how, pray tell, are we going to integrate “Leap Day” into our sales and marketing? We certainly do not want to encourage brides NOT to book our hotel during 2016 because they are worried about the doom of a marriage that happens the other 365 days of 2016! So maybe we focus on the good luck the Irish tout about the fact that women can propose to men on this date? Run a romance special that focuses on proposals! Or maybe we just scrap the whole love angle and offer a special that happens only “once every 4 years”. Change the price of every room to $129.29 for the day. Sell the first 29 rooms at $29. Give the first 29 guests a free upgrade (if you have 29 unsold upgradable options). Let all 29-year-olds get their rooms for $29. Reduce your meeting room rent to $29 for the day. You get the drift…… Be clever. Be professional. Be entrepreneurial. Happy leaping over the competition! Posted in All Blogs, Marketing, Packaging and Promotions, Social Media Tagged Leap, Leap Day, Leap Year, Will You Marry Me?